**Recent immigrant: At least one parent reported that they had become a landed immigrant in Canada in the 10 years prior to the survey. ***LICO (low income cut off) data based on postal code information. Low social cohesion in NL, PE and NB – Use with caution. Children under 6 in urban communities were more likely to live in neighbourhoods that their parents felt had low levels of neighbourhood cohesion1than were those living in rural areas. Children who were recent immigrants were more likely to live in neighbourhoods that their parents felt had low levels of neighbourhood cohesion than were children who were not recent immigrants. 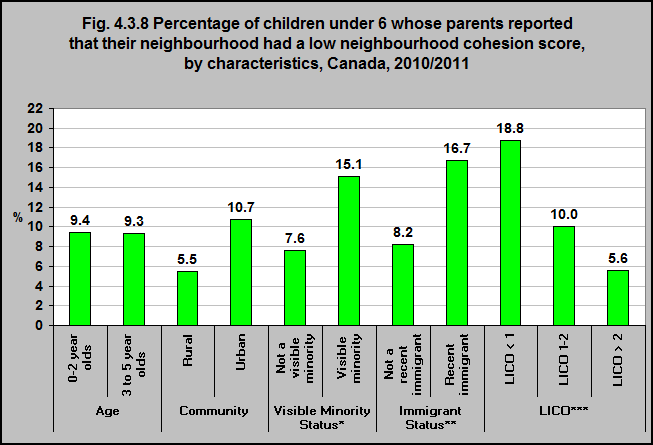 Children who were from visible minority groups were more likely to live in neighbourhoods that their parents felt had low levels of neighbourhood cohesion than those who were not from visible minority groups. Children living in low income households were more likely to live in neighbourhoods that their parents felt had low levels of neighbourhood cohesion than those in higher income households. 1The purpose of the neighbourhood scales is to assess the extent of the presence/absence of certain neighbourhood characteristics. In particular, the neighbourhood cohesion scale can be used to measure the social unity of a neighbourhood (the extent to which the PMK- person most knowledgeable- feels that there is cohesion in the neighbourhood). Adult respondents were asked whether people in their neighbourhood are willing to help each other, deal with local problems, keep an eye open for possible trouble, and watch out for the safety of neighbourhood children, and whether they are people that their children can look up to. All questions about the neighbourhood were administered to the PMK or spouse/partner of the PMK. To identify low levels of neighbourhood cohesion, thresholds (or cutoff points) were established by taking the scale score that is closest to the 10th percentile based on Cycle 3 data for children in all provinces. The variable represents the proportion of children whose neighbourhoods exhibit lower levels of cohesion (as reported by the PMK) and those whose neighbourhoods do not. The Well-Being of Canada’s Young Children: Government of Canada Report 2011. Technical Notes. http://www.dpe-agje-ecd-elcc.ca/eng/ecd/well-being/page12.shtml-accessed July 24, 2017.